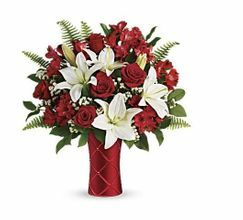 Sweep them off their feet with this luxurious bouquet of red roses and fragrant white lilies, presented to perfection in a gorgeous ceramic vase with silky satin finish. Copyright © 2019 irvingflowersgifts.com. All rights reserved.